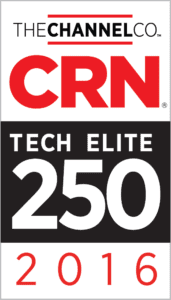 San Jose, Calif., March 29, 2016 – INFINIT Consulting announced today that CRN®, a brand of The Channel Company, has named INFINIT Consulting to its 2016 Tech Elite 250 list. This annual list honors an exclusive group of North American IT solution providers that have earned the highest number of advanced technical certifications from leading technology vendors. INFINIT has a dedicated team of engineers that prioritize advancing their skills through training on an ongoing basis. From numerous Microsoft trainings for Azure to Skype for Business, INFINIT is committed to ensuring that we are always advancing our skills as a company. INFINIT has earned and maintained numerous Microsoft Gold certifications and continues to seek out trainings and certifications for other key manufacturers such as IBM’s Watson analytics.